PHOENIX — The calendar says winter is weeks away, but the thermometer says otherwise. For that reason the Arizona Game and Fish Department reminds undeterred paddlesport enthusiasts to practice coldwater safety when heading on the water. The U.S. Coast Guard reports that cold water immersion and hypothermia can occur in water as cool as 70 degrees. Even in a healthy person, cold-water immersion can impact muscle movement, breathing and heart rate. Prolonged exposure to the water can lead to hypothermia, cardiac arrest and death. Whether enjoying Arizona’s waters from a paddleboard, kayak, canoe or boat, life jackets are an important part of boating safety. They help to keep a person’s head above water and body on the surface. While life jackets are required for those 12 years old and younger, wearing a life jacket is a simple step that could be lifesaving for persons of any age. If you do fall overboard, stay calm, move slowly and don’t try to take off clothing while in the water. And if the boat has capsized, it most likely will not sink and can be used as a platform. It’s advised that boaters stay on top of the capsized vessel or paddleboard as much as possible in order to stay out of the water. Survival may also depend on how well you’re dressed to cope with cold water. Wearing thermal protection like a wetsuit or drysuit so that you don’t experience cold shock. Wearing enough protection to keep you functioning if you have to swim or get towed to shore, and if you can’t get to shore, enough protection to keep you alive long enough to be rescued. Wearing a float coat provides the comfortable fit and warmth of an insulated jacket, while also providing the functionality of a life jacket. A float coat does not provide hypothermia protection or replace anti-exposure coveralls or a dry suit. Be sure to check that it’s U.S. Coast Guard-approved. A dry suit, or anti-exposure coveralls, keeps the boater dry and protects him or her from hypothermia. It’s worn over proper clothing layers. 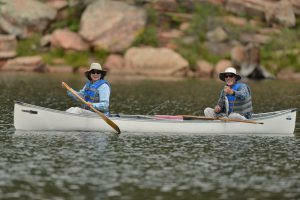 Boaters should try it on with their clothing layers to ensure they still have needed mobility for the boating activity. Carry at least two communication devices that will work when wet, such as a VHF FM-DSC marine band radio and an emergency position-indicating radio beacon or personal locator beacon. Keep emergency spare blankets on board in case someone is suffering from hypothermia symptoms. Boaters also can brush up on their knowledge by taking one of the Arizona Game and Fish Department’s free education courses at www.azgfd.gov/boating and clicking "Boating Safety Education."